Every day Mahmoud takes his sheep and goats out to the fields that his family has used and been bound to through blood and sweat for generations. 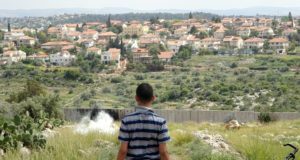 Every day he is met by violence and threats of violence by the ultra-orthodox settlers who live two hills away, who say that the land is theirs because it was given the by their God four thousand years ago. 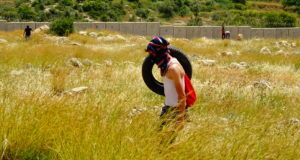 Every day he is forced from his lands by the soldiers of the occupation forces who are protecting the illegal settlers. Every day he loses the fight for the land that is his, his only way of surviving. Every night he and his wonderful family sleep in a tiny tent without water, electricity and plumbing because they’ve been refused building rights on their own land for forty years – while the settlers two hills away are provided with every resource by the state of Israel. But every night he goes with his brothers and their children to the football field and he becomes Mahmoud Maradona, and laughs like crazy with joy when he scores in the light of the setting sun over the hills of south Hebron. 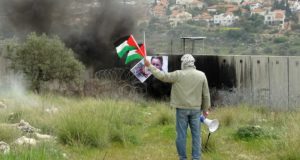 Every Friday Fatima sees her son Hassan go at the head of the demonstration that marches from her house towards the illegal wall that Israel is building across their land, the wall that is destroying their olive groves and taking away their right to travel freely in their own land. One of her sons was killed by the military, and another but in prison while non-violently expressing his disgust and protest against the occupation. Every Friday she knows that Hassan maybe won’t come back, since every Friday for the past months he has been arrested and held for four days by the military. Every day her family lives under constant harassment from the soldiers. But every Friday Hassan is home again, and Fatima offers her friends and international activists sweet tea and laughs, and shares her warmth, her joy of life and her inexhaustible fighting spirit – telling us about the occupation and what it is doing to her people and her children. Every day Mustafa’s father goes to the wall in Ni’lin. Every day he comes home with eyes that are red from teargas. Mustafa, who is four years old, had a teargas grenade fired into his home last week when the army occupied Ni’lin, and since then he plays a lot with an onion – onion is used to counter teargas. Every guest that comes into his home gets to play with his onion. When the grenade exploded he was silent for a long time, marked by the fear of the grownups that they will lose seventy percent of the olive trees that have been in their ancestors planted centuries ago. Every day his father has to tell him that the soldiers who came into their home and who occupied the village are friends, and that they are just playing. Mustafa has seen more weapons in his four years than I will in my entire life. But when we are invited for dinner he plays with us, he laughs and flirts and charms us, he gives us his onion and sits a while peacefully in his father’s lap. These people fill me with such awe and admiration that I have a hard time finding the right words. They welcome us into their homes, they give us of the little they have and say that we are brave who come here. I feel ashamed when they do – we are going home in three weeks or two months but they have no choice, they will fight the occupation until they die or until they win the peace that they always speak of, the peace that is ever present in their language. Again I must say: the occupation is illegal. Collective punishment is a war crime. Destroying and breaking down an entire people is a crime against humanity. The wall is illegal, declared so in international courts of law. What Israel is doing to the Palestinian people is comparable to what happened in South Africa. This is Apartheid, and it will not stop until the world sees it for what it is and puts pressure on Israel to stop it. But the Palestinian people will never give up.